View cart “Stipula Faceted Etruria Oversize Piston Mottled Black and Green Celluloid Limited Edition Ballpoint Pen #1/3” has been added to your cart. 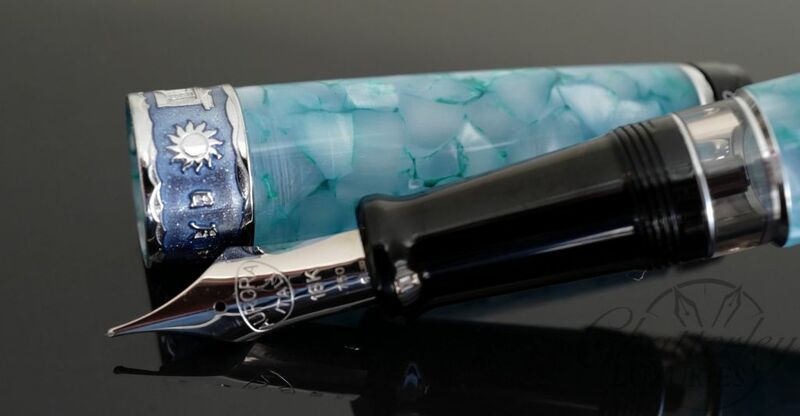 Up for sale is the brand new Limited Edition Sword Fountain Pen. This pen is in Black resin with Gold Vermeil trim Fountain Pen that uses a piston filler to draw ink. These pens are limited to 88 pens world wide. 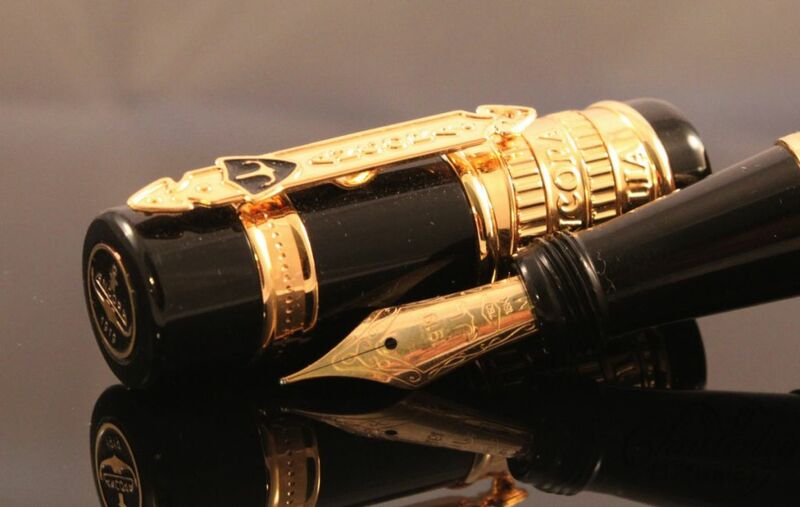 This one for sale is the number 1/88 fountain pen and is fitted with an 18kt gold Medium nib. In 333 B.C. Alexander the Great had invaded Asia Minor and arrived in the central mountains at the town of Gordium; he was 23. Undefeated, but without a decisive victory either, he was in need of an omen to prove to his troops and his enemies that the outcome of his mission – to conquer the known world – was possible. In Gordium, by the Temple of the Zeus Basilica, was the ox cart, which had been put there by the King of Phrygia over 100 years before. The staves of the cart were tied together in a complex knot with the ends tucked away inside. Having arrived at Gordium it was inconceivable that the young, impetuous King would not tackle the legendary “Gordian Knot”. Alexander climbed the hill and approached the cart as a crowd of curious Macedonians and Phrygians gathered around. They watched intently as Alexander struggled with the knot and became frustrated.Alexander, stepping back, called out, “What does it matter how I loose it?” With that, he drew his sword and in one powerful stroke severed the knot. That night there was a huge electrical storm, which the seers conveniently interpreted to mean the gods were pleased with the actions of this so-called Son of Zeus who had cut the Gordian knot. This New Sword include a Piston Filler System, an exclusive made by Ancora in house 18K Medium Nib and the special resin and acrylic made for the exclusive high-end pens. No box is available with this pen.